Having trouble making ends meet? Ask your social worker or transplant coordinator to apply for our financial assistance program (lost wages due to organ donation, prevention of insurance loss, and access to anti-rejection medication during insurance gap-periods for recipients). 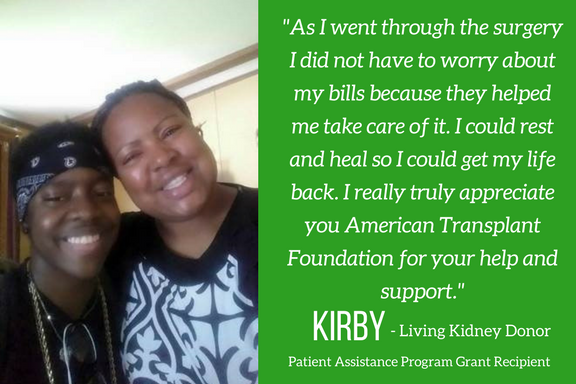 The American Transplant Foundation is proud to be able to provide real help to real families when they need it the most. We help living donors to cover essential living expenses due to lost wages during recovery after your surgery. For transplant recipients, we help with delinquent insurance premiums to prevent loss of insurance coverage, medication co-payments during insurance gap periods, and/or changes to insurance provider. Please see below for specific guidelines. To learn more about how the Patient Assistance Program works, please refer to our Frequently Asked Questions here: Patient Assistance Program FAQs . For other financial assistance resources, you can download our most updated guide for 2019 here. 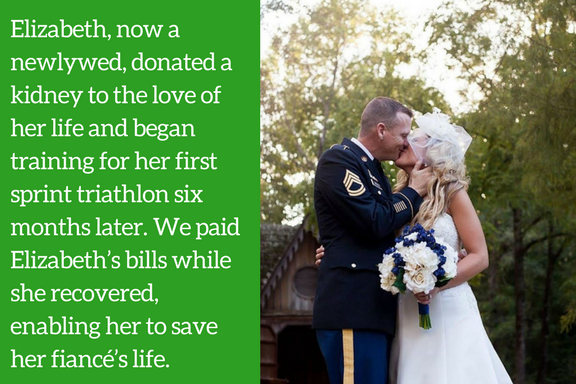 To date, we've provided $820,000 to living donors and transplant recipients nationwide, and worked with over 80 transplant centers. Our program is designed to provide financial assistance for the most vulnerable patients with significant financial hardship. 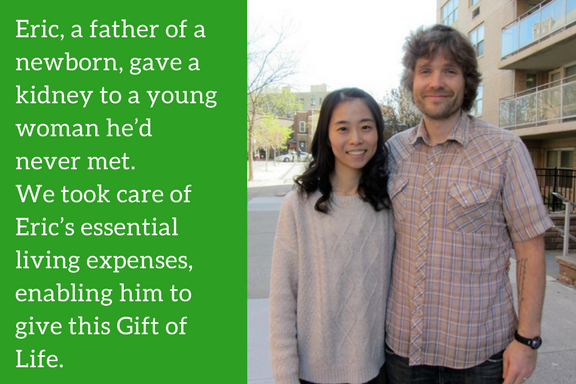 Our goal is to provide support to living donors so they won’t be in a financial trouble after giving the Gift of Life and to ensure transplant recipients have access to medication that keeps them alive. 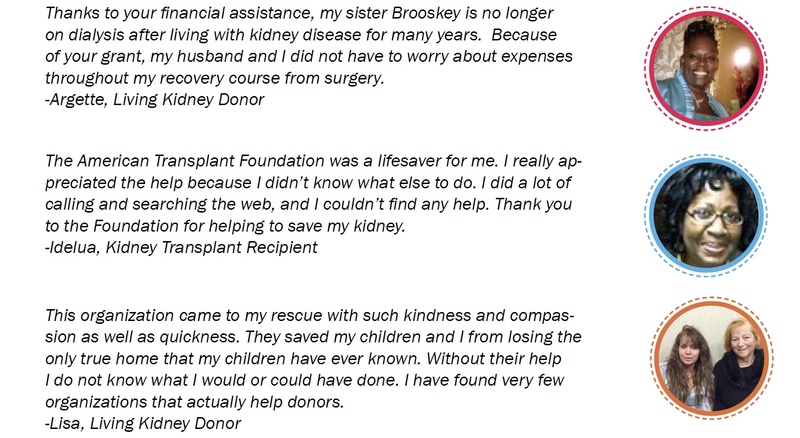 This is the only program of its kind that is available nationwide that provides emergency financial assistance grants to transplant recipients and living organ donors, regardless of their legal status. All financial decisions are made by our Transplant Leadership Council (TLC) members. We do not receive any government funding and rely on generous individuals to provide lifesaving donations that benefit patients in need. Due to a high volume of applications, social workers/living donor coordinators need to submit applications as much in advance as possible, at least 2-3 weeks before the surgery date. Applications may only be submitted by social workers and transplant coordinators. Please talk to your social worker/transplant coordinator and refer them to our website. Once the application is submitted (for living donors- along with an employer letter), expect the processing time to be 2-3 weeks to receive a funding decision from the volunteer voting committee via email. Unfortunately, we cannot consider incomplete applications. Please make sure to submit an employer letter with the application. If you are having trouble uploading the application or it is not saving, please contact us immediately. Applications may only be submitted by social workers and transplant coordinators. Individuals seeking assistance should contact their assigned social worker at their personal transplant center for details. Due to a high volume of applications, please submit your application as much in advance as possible, at least 2-3 weeks before the surgery date. Once the application is submitted (along with an employer letter if applying for living donor assistance), expect the processing time to be 2-3 weeks to receive a funding decision from the volunteer voting committee. Unfortunately, we cannot consider incomplete applications. Please have all vendor, insurance, income/expenses information ready before beginning the application. You may not save and return later. Please take the time to desribe in detail why the patient is in need of assistance. We are driven by government guidelines, we are driven by our desire to help patients and their families and we need your help to have an accurate picture of the situation the patient is dealing with. Every application that we process is presented to our Transplant Leadership Council members, a group of dedicated volunteers, who ultimately vote on the funding decision; they don't have access to information related the patient's transplant center. Please see our FAQ document below for more details on how funding decisions are being made. If this is your first application within the last 12 months, you will need to set up an orientation with the American Transplant Foundation. Please email us at support@americantransplantfoundation.org to set up a brief 10-minute conversation. Financial assistance applications for living donors must be submitted at least 2-3 weeks before the date of the surgery. This gives us enough time to process the application and ask any follow-up questions, if needed. Applications for Living Donors after the surgery will only be considered if the patient has significant complications within 30 days after the surgery and is required to take more time off than originally planned. We compensate for the wages lost during the recovery period for living organ donors, so the applicant must be employed and experience a loss of income while recovering from the surgery. Financial assistance covers loss of wages during the hospital stay and/or recovery due to organ donation; essential living expenses such as rent, electric, automobile, and phone bills. The Social Worker is responsible for sending confirmation of surgery to the Foundation via email the day of the surgery. We will then release funds within 2-3 business days of notification. We are piloting the program when funds are released directly to the patient. To be considered, your application needs to include the following paperwork: 1.) Signed documentation from the living donor's employer stating specifically how much paid time off and/or short term disability/employee assistance benefits the patient has available for use during their recovery. Ideally, this letter needs to be on a company's letterhead. All letters need to include a contact phone number and/or email for the employer who is providing the letter. 2.) The living donor applicant’s most recent pay-stub - this is optional, but will help us to expedite the application. Please obtain this documentation prior to starting the application – you will be able to upload it directly into the application. If you have any questions or are unable to obtain this information, please contact us at Support@AmericanTransplantFoundation.org. We are experiencing a drastic increase in requests for lifesaving funds and only able to consider the most financially vulnerable transplant patients at this time. Please only submit applications for those in extreme need. Our maximum grant amounts continue to be capped at $500. We care deeply that these funds remain available to patients when they need it the most. If your transplant center is interested in supporting the Patient Assistance Program to help ensure patients receive this emergency assistance, please contact us. This is a one-time, temporary assistance granted to the recipient to help with delinquent insurance premiums to prevent loss of insurance coverage and for medication co-payments during an insurance gap period and/or changes in insurance provider. The max cap for the grant is $300. If you are in need of long-term assistance, please contact your social worker regarding extended funding from other resources (ie. supplemental insurance, drug manufacturer programs, local/state programs). Check out our Financial Resources Guide availalbe on our website. 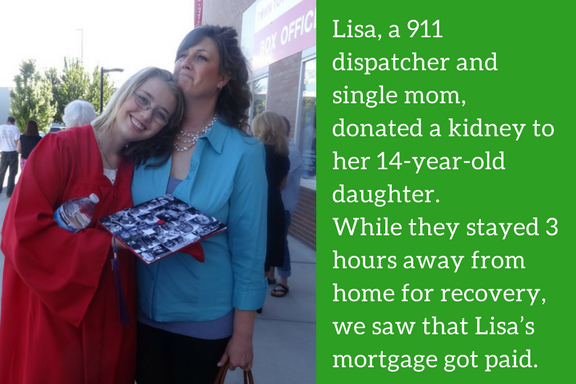 Eligible candidates include those with delinquent insurance premiums to prevent loss of coverage or those needing help with co-payments during insurance gap periods. Applications for transplant recipients must be submitted post-surgery. Please include as much detail as possible about the patient's situation in the Reason for Referral section. Please double check the Household Revenue and Expenses section. We will notify the social worker in approximately 2-3 weeks after your application is submitted regarding our volunteer voting committee's funding decision for your application. For more information, please email us here.